There have been Japanese Holmesian figures before, like Detective Conan, but there has never been a consulting detective at #221B who was this stylish. She might also be the brusquest and rudest Sherlock ever. She makes Cumberbatch’s Holmes look like Alan Alda in his whiny, in-touch-with-his-feelings 1970s prime. Of course, that is also why she is so much fun to watch, but her new roommate finds her dashed difficult to live with. That would be Dr. Wato Tachibana, or Wato-san. 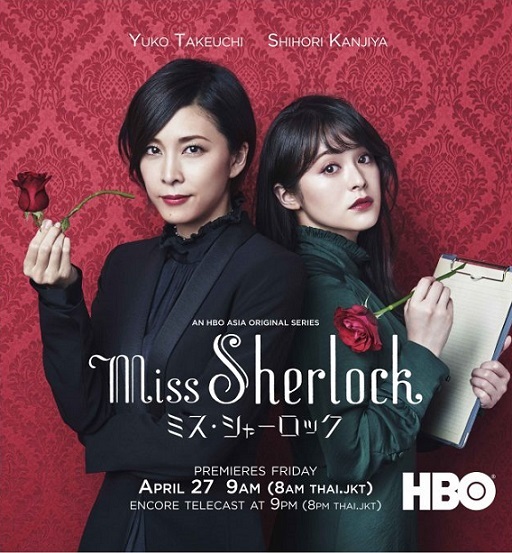 You had better believe the games afoot in Miss Sherlock, the first production of HBO Asia made available on HBO Go and HBO Now, starting today. A rough stint volunteering in Syria with a Doctors Without Borders NGO already had Dr. Tachibana questioning her choice of a medical career. Then her mentor Takashi Mizuno is assassinated right before her eyes with some sort of internal explosion. As he is apt to do with a case of any degree of complexity, Inspector Gentaro Reimon summons a consulting detective known simply as Sherlock (a name that everyone finds utterly baffling). Naturally, Tachibana is appalled by her insensitive treatment of Mizuno’s widow. Yet, the circumstances of the case keep bringing them together. In fact, when Tachibana’s hotel is mysteriously leveled by an explosion, Sherlock’s brother Kento Futaba somewhat impishly invites her to move in with his sister. Why yes, he holds a very hush-hush position within the government. However, he and Sherlock get along better than Mycroft ever did with the Victorian Holmes (one of many tweaks in Miss Sherlock that works quite well). During the first six episodes, Sherlock and Wato-san investigate mysteries that are mostly separate and discrete, but still seem to share an obscure connection to some sort of hazy criminal cabal. Arguably, the best mysteries involve an apparent incident of vampirism and the disappearance of a newlywed bride, but they are all pretty strong and consistent. However, episodes seven and eight, dive full on into the conspiracy in an overt homage to The Final Problem, the only original Holmes mystery Miss Sherlock explicitly riffs on. Miss Sherlock has a terrific cast, including many faces fans of Japanese cinema will recognize. Yuko Takeuchi (Creepy, Magnificent Nine) is an absolute blast playing Sherlock, as long as you do not have to live with her. She can out do Cumberbatch’s verbal calculations, while rocking Hermes overcoats. Shihori Kanjiya (Vancouver Asahi, Golden Slumber) provides a resonant humanist center and general rooting interest as Wato-san. Believe it or not, Kenichi (The Inerasable, Unforgiven) Takito’s Inspector Reimon could very well become many fans’ favorite Lestrade. Regardless, he delivers the character’s most redemptive incarnation perhaps ever, even more so than Rupert Graves opposite Cumberbatch. Yukiyoshi Ozawa (The Forest, Rurouni Kenshin 2 & 3) deserves similar credit for the verve he brings to Futaba, the Mycroft analog, somewhat humanizing him, but adding a bit of roguish attitude. The Moriarty figure is also terrific, but it would be telling to call said mystery person out—even though most fans will be trained to recognize who that might be rather early on. The caliber of the episodic guest stars is also quite high, especially Mahiru Konno and Haruka Kinami, who play Arisa and Yuma Shiina, two dysfunctional sisters embroiled in a plot to steal a potentially lethal chemical compound (and look out for Rinko Kikuchi in episode seven). The battery of screenwriters does a nice job of modernizing and culturally adapting Conan Doyle, without becoming slavishly beholden to the source material. Yet, they still channel enough of the original spirit to keep fans happy. They also raise the stakes higher than just about any other Holmes homage. Plus, Ken’ichiro Suehiro’s distinctive music amplifies the tension and helps give the series its own identity. There is no question, the series borrows elements from the Cumberbatch Sherlock and Elementary, but Takeuchi makes them her own. 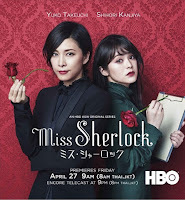 Enthusiastically recommended for all Holmesians/Sherlockians as well as fans of Japanese mysteries, Miss Sherlock is now available on HBO Now and HBO Go.